The Daily Register is a publication of the University of Idaho designed to share policy issues, news and events with the campus community. As the primary communication medium for official information, it is delivered to all faculty and staff via email daily during the work week. This publication only prints items of university interest. Events must be sponsored by official university units or organizations. Your source for faculty and staff news. University Faculty Meeting: The next University Faculty Meeting will be 3 p.m. Pacific time/4 p.m. Mountain time Wednesday, May 1. Statewide locations: Twin Falls — B-66; Boise — 248A; Coeur d’Alene — 145C; Idaho Falls — TAB 350; and Moscow — Vandal Ballroom, Bruce M. Pitman Center. At 3:30 p.m. today, April 19, in Renfrew 111, Moscow, world-renowned climate scientist Steve Ghan will talk about climate tax and dividend legislation that could reduce U.S. carbon emissions. The speech is organized by the U of I Sustainability Center and the Palouse chapter of the Citizens’ Climate Lobby as part of the lobby’s annual conference. Join the Biodiesel Education Program for a tour of the biodiesel lab at 3 p.m. today, April 19, in JML Bay 72, Moscow. The program is excited to show how it makes biodiesel as well as how it’s used to make U of I a cleaner campus. The Vandal Clean Energy club will also introduce its new B100 biodiesel tank. Join Professor Greg Möller for a motivational talk at 9:30 a.m. today, April 19, in Room 106 of the Agricultural Science Auditorium. “The Quest for Earth” is a call to action for a positive future that includes balance to the relationship between humankind and Earth. This event is a part of the Sustainability Center's Earth Fest and will be live-streamed globally from uidaho.edu/earth. Vandal Athletics will host an equipment and apparel sale 4-8 p.m. today, April 19, and 11 a.m. to 3 p.m. Saturday, April 20, in the ASUI-Kibbie Activity Center vehicle court. Shop for gear today before the Vandal Football Silver and Gold Spring Game and Saturday before the women's soccer match vs. Central Washington University. Brand new and used equipment including shoes, jerseys, shorts, polo shirts, shirts, sweatshirts and hats will be available for great prices. Cash or check only. Go Vandals! The search advisory committee and the Office of Research and Economic Development are pleased to invite three finalists for the Idaho EPSCoR position to campus. The finalists will interview April 22-26. The university community is invited to attend open forums for each finalist. The forums will be recorded and available for review following the final candidate forum. The first open forum will take place at 2 p.m. Monday, April 22, in Morrill Hall 402 and via Zoom. Additional information regarding the two following candidates will be announced soon. Reach out to Kathleen Daly with any questions at kdaly@uidaho.edu. The fourth annual Active Learning Symposium will be held Tuesday, April 30, on the first and fourth floors of the Idaho Commons, Moscow. Breakfast will be served at 8 a.m. and sessions will run from 8:30 a.m. to 12:30 p.m. Choose from 16 45-minute interactive presentations featuring award-winning University of Idaho faculty. Topics include participatory learning, problem-solving in the classroom and strategies to maximize engagement. Register now. The International Programs Office (IPO) is pleased to announce an opportunity to host a Russian student July 28 to Aug. 18 as a part of the Year of Exchange for Russians Program (YEAR). This program is funded by the U.S. Embassy in Moscow, Russia, and administered by American Councils for International Education in partnership with the University of Idaho. Host families will be compensated $300 to host the student. The purpose of the homestay is to build strong cross-cultural relations with members of the community. After completion of the homestay, students move into dormitories for the start of the academic year but maintain close contact with their family through the remainder of the year. Read more. Enjoy a fun Marvel-themed event Monday, April 22, in the ASUI Student Lounge, Idaho Commons, Moscow. At 2:30 p.m. there will be a workshop in Adobe Premiere Pro on how to make a cinematic movie trailer. The workshop includes snacks and movie gift card prizes. At 4 p.m., Sanjay Sisodiya will present, "Movie Franchises: Too Fast, Too Furious" on his research in the film industry. Attendees will enjoy free pizza. At 6 p.m., there will be a Marvel trivia competition, with snacks and gift card prizes. The Auditorium Chamber Music Series presents the world-renowned a cappella vocal group of eight men, Cantus, at 7:30 p.m. Tuesday, April 23, in the Administration Building Auditorium. The program, "Alone Together," is a fascinating mix of contemporary pop songs and classical pieces reflecting a unified theme. Tickets can be purchased outside of the event at 7 p.m. or online. Celebrate bike season on Bike to Campus Day Thursday, April 25. Prizes will be awarded to bike riders throughout the day. University of Idaho faculty, staff and students, as well as industry leaders and community members are invited to experience the 2019 Engineering Design EXPO. EXPO 2019 will be held 9 a.m. to 3:30 p.m. Friday, April 26, in the Bruce M. Pitman Center, Moscow. A complete schedule of events can be found at uidaho.edu/expo. EXPO showcases senior projects from the College of Engineering's senior capstone program. This year's keynote speaker is Mark Bathrick, director of the U.S. Department of the Interior's Unmanned Aircraft Systems program. He will speak at 2 p.m. Friday, April 26, in the Vandal Ballroom of the Bruce M. Pitman Center. Chrome River, the new travel management system for the University of Idaho, will go live at 8 a.m. Pacific time Monday, April 22. To ensure a smooth transition to the new system, the project team elected to keep the current Travel Web system accessible through Tuesday, April 30. Read more. Events are held in Moscow unless otherwise noted. Get more events at uidaho.edu/events or subscribe to the weekly events newsletter This Week. Cattle moseying down a trail. Sagebrush dotting the horizon. Robots whirring overhead. This isn’t a scene from a sci-fi movie. This is where University of Idaho junior Dan Lauritzen conducts his research. Lauritzen, a double major in Rangeland Conservation and Fire Ecology and Management in the College of Natural Resources, has wanted to pursue a career in range ever since he won the Idaho State Rangeland Assessment as a high school junior in Hagerman. Read more. The University of Idaho’s student-led TEDxUIdaho event will explore ideas ranging from the art of science to leaving an abusive relationship during the fifth annual event from 1-4 p.m. Saturday, April 27, in the U of I Administration Building Auditorium on the Moscow campus. With a theme of “Brave,” the event features seven speakers, including U of I graduate and undergraduate students and community members, Talks include research on the rain on Saturn’s moon Titan, how to ethically report on Native Americans in the news media and advice on relationships. Other presentations will focus on how medical professionals should take care of their own mental health and the science of hope. Read more. Athena, the University of Idaho association of staff and faculty committed to promoting an inclusive and equitable climate for women, celebrates the work of faculty and staff members each April who have demonstrated clear and sustained dedication to professional enhancement of women. The 2019 award recipients will be recognized at the Women of the Year awards ceremony and reception to be held at 5 p.m. Monday, April 22, at University House on Nez Perce Drive on the U of I campus. Read more. 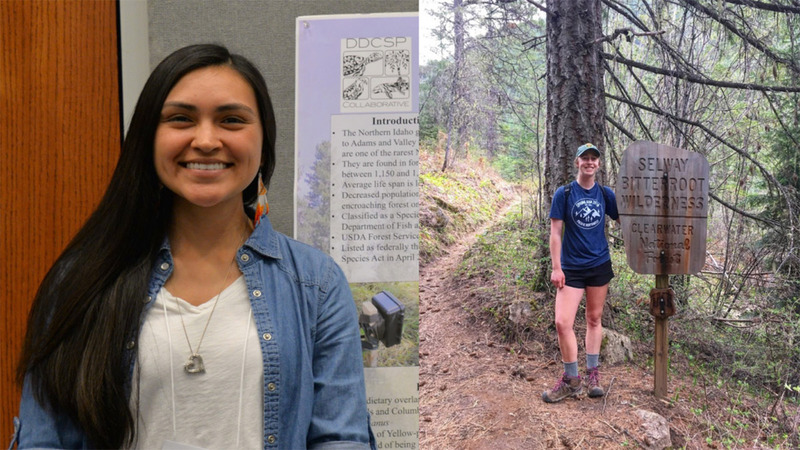 The University of Idaho Distinguished Scholarships Program, along with the College of Natural Resources, is pleased to announce that two U of I students, Kassandra Townsend and Madi Thurston, have earned Honorable Mentions in the Udall Scholarship 2019 competition. Udall Scholarships and Honorable Mentions are awarded to students based on their commitment to careers in the environment, Native health care or tribal public policy; leadership potential; record of public service; and academic achievement. Read more. View a complete listing of career opportunities available at the University of Idaho. The Daily Register is a publication of the University of Idaho designed to share policy issues, news and events with the campus community. As the primary communication medium for official information, it is delivered to all faculty and staff via email daily during the work week. This publication only prints items of university interest. Events must be sponsored by official university units or organizations. All material is subject to editing according to space, style and policy requirements. Submit an item for publication or submit an item to the calendar. Not the email you wanted to get? Customize what emails you receive from the University of Idaho by updating your preferences. You can also opt out of all University of Idaho email communications. General Policy Report No. 68, dated April 5, 2019, is available for viewing, downloading or printing. This notice is required as per FSH 1420 A-1 c. 2., FSH 1460 c. 2. ii., and FSH 1540 C. Items listed on this report will have the necessary faculty approvals unless a petition requesting further consideration of a specific item is signed by five faculty and submitted to the chair of Faculty Senate by April 19, 2019. Ali Noorani, a leading voice on immigration in the U.S. and executive director of the National Immigration Forum, will speak this evening, April 18, as part of the College of Agricultural and Life Sciences Speaker Series. His talk, “Out of Many, One: A Defining Moment for American Immigration,” will begin at 6 p.m. today in the Kenworthy Performing Arts Centre, 508 S. Main St., Moscow. Learn more. Chrome River, the new travel management system for the University of Idaho, will go live at 8 a.m. Pacific time Monday, April 22. To ensure a smooth transition to the new system, the project team elected to keep the current Travel Web system accessible through Tuesday, April 30. Important transition details can be found on the U of I Chrome River webpage. The Faculty Senate meets weekly on Tuesdays during the academic year to discuss and act on policy matters pertaining to the immediate government of the university. Read the talking points from the April 16 meeting. The search committee for the director of Financial Aid has invited three top candidates to the Moscow campus for interviews. All are welcome to attend presentations and Q&A sessions with each candidate that will take place at 10:30 a.m. April 19, 23 and 25 in the Alumni Lounge, Hayes Hall, Moscow. The presentation topic is: As financial aid director, how would you leverage resources to provide greater access to educational opportunities to meet the evolving needs of society? The candidates are Laura Hughes, financial aid director at Lewis-Clark State College (Friday, April 19); Leslie Hammes, associate director of financial aid at U of I (Tuesday, April 23); and Randi Croyle, associate director of compliance and operations at Washington State University (Thursday, April 25). A zoom link is provided for those who are located off the Moscow campus. The Central Device Management (CDM) program, part of the Information Technology (IT) Best Use Initiative, is in full swing and most IT support staff are involved in the effort. IT local support across the Moscow campus, including ITS Technology Solutions Partners, will be very busy with project work through May 24. ITS kindly asks for everybody’s patience with IT support needs and requests during this period. Read the implementation updates. The University of Idaho Research Computing and Data Science Symposium will take place 8 a.m. to 5 p.m. Thursday, May 16, in the Vandal Ballroom of the Bruce M. Pitman Center, Moscow, and will provide a forum for U of I scholars who are interested in generating, analyzing or visualizing large and complex data sets. The symposium will connect researchers to the staff and faculty who supply and maintain the research computing infrastructure that is critical to data science. Featured will be a poster session and a series of lightning talks from the many disciplines that intersect with research computing and data science. Register now, spots are limited. The Handling Disclosures of Interpersonal Violence session will take place at 3:30 p.m. Tuesday, April 23, in the Whitewater Room of the Idaho Commons, Moscow. Learn more about the role of a university employee as it relates to Title IX processes. Employees will gain increased confidence in handling disclosures and increased knowledge of resources, referrals and after-the-fact care. This training is hosted by the Women's Center, Violence Prevention Programs, the Office of Civil Rights and Investigations, and CETL. Register now. College of Law Professor Anastasia Telesetsky and Professor Adam Sowards in the College of Letters, Arts and Social Sciences invite all U of I researchers and academics to join their informal Lunch and Learn conversation titled, "Going Public: Ideas for Getting Scholarly Ideas into the Public Arena" at noon Thursday, April 25, in the IRIC Atrium, Moscow. Read more. Join students in the College of Art and Architecture's Virtual Technology and Design (VTD) Program from 2:30-5:30 p.m. Friday, April 26, to check out client-approved virtual worlds they have created for the purpose of entertainment, simulation and visualization. Stations with students' projects will be set up in IRIC 121 and the lower level of the Art and Architecture VTD Building. The Integrated Research and Innovation Center (IRIC) Facility Committee continues to consider applications for space in the IRIC facility. U of I faculty and staff can access application forms. The deadline for the next round of consideration is 4 p.m. Friday, April 19. Read more. As the world population continues to grow, so too does the demand for agricultural products — including dairy. But an increase in milking cows has resulted in an increase in nitrogen emissions, one of the largest pollution issues surrounding the dairy industry. Allison Stevens decided to tackle the issue as a graduate student at the University of Idaho. Read more. Idaho’s three universities are teaming up to provide Idaho scientists and engineers the opportunity to learn firsthand about policymaking through a yearlong fellowship. The Idaho Science and Technology Policy Fellowship (ISTPF) is a nonpartisan professional development program led by the James A. and Louise McClure Center for Public Policy Research at the University of Idaho. The ISTPF is committed to connecting doctoral-level scientists and engineers to the development and implementation of relevant state policies. Graduate and professional students, postdoctoral fellows and assistant professors at U of I, Boise State University and Idaho State University will be invited to participate in various aspects of the fellowship. Including future leaders will help Idaho develop a trained workforce in science and technology policy. Read more. Damon Burton of the College of Education, Health and Human Sciences was selected to receive the Idaho Recreation and Park Association's Outstanding Individual Award for 2019. His selection was based on his 30 years as a member of the city of Moscow Parks and Recreation Commission. During his tenure on the commission, Burton served as chair and helped usher in the Hamilton-Lowe Aquatics Center, Hamilton Indoor Recreation Center, Moscow School District Community Play Fields and Paradise Path, and the associated pathways. He also influenced the construction of a number of new parks. Burton served on the Pathways Commission (formerly known as the Linear Park Task Force) for five years and has been a key player in the development of three parks and recreation master plans. Congratulations to the College of Education, Health and Human Sciences’ Margaret Vaughn for her paper, "Documenting Adaptive Instruction: The Adaptive Teaching Observation Protocol." The paper earned her the American Educational Research Association's (AERA) Classroom Observation Special Interest Groups’ 2018 Exemplary Paper Award. Vaughn received her award at the AERA's conference in Toronto, Ontario, Canada. U of I doctoral graduate Shannon MacKenzie, Associate Professor Jason Barnes and Assistant Professor Matthew Hedman from the Department of Physics published in Nature Astronomy. Using Cassini spacecraft observations, the team identified three north pole lakes that seem to disappear between winter and summer on Titan, Saturn's largest moon. Their findings likely provide regional evidence for seasonal changes in evaporation and precipitation and may have implications for sediment processing and habitability. As a convenience for faculty, the Student Technology Center is available for inventory and installation of the management tool for the Central Device Management program. If faculty received an email from “University of Idaho Support” with a subject of “Service Request Created (IT Best Use Initiative…)” regarding IT staff scheduling a time for enrolling your devices, faculty with laptops may opt instead to bring their laptop(s) 8 a.m. to 5 p.m. through Friday, April 19, to Room 128 of the Student Technology Center, in the TLC. Otherwise, IT support staff will continue office visits through this week where possible or schedule a time that works best for faculty. Learn more about the Central Device Management program. Athena is pleased to announce Department of Sociology and Anthropology Professor Leontina Hormel and Associate Professor, Interim Associate Dean, and Head of User and Research Services Kristin Henrich, University of Idaho Libraries, as the winners of this year's Women of the Year Awards. We are also happy to announce Rebecca Witinok-Huber, a doctoral student in the Water Resource graduate program, as the Athena Student Excellence award winner. All are invited to the celebration of these women from 5-7 p.m. Monday, April 22, at the newly opened University House. There will be complimentary appetizers and a no-host bar. RSVP online by today, April 17. At 3:30-4:30 p.m. Friday, April 19, in Room 111 of Renfrew Hall, join world-renowned climate scientist Steve Ghan to hear about current legislation that could turn the tides on climate change in America. Approximately a third of the University of Idaho's carbon footprint comes from air travel. Take the anonymous survey to share thoughts on an air travel mitigation program. The newest selection of Vandal-connected wines feature Basalt Cellars and Clearwater Canyon Cellars. Four bottles, three red and one white, will ship late April to Vandals Uncorked wine club members. Find out more about Vandals Uncorked wine club. Vandal Athletics will host an equipment and apparel sale 4-8 p.m. Friday, April 19, and 11 a.m. to 3 p.m. Saturday, April 20, in the Kibbie-ASUI Activity Center vehicle court. Shop for gear on Friday before the Vandal Football Silver and Gold Spring Game and Saturday before the women's soccer match vs. Central Washington University. Brand new and used equipment including shoes, jerseys, shorts, polo shirts, shirts, sweatshirts and hats will be available for great prices. Cash or check only. Go Vandals! The Latah County Vandal Boosters (LCVB) invite University of Idaho community to attend the annual dinner auction, Tailgate of Champions, that will be held 5:30-10:30 p.m. Saturday, April 20, at the Best Western University Inn. The LCVB and Vandal Scholarship Fund support scholarship opportunities for over 300 student-athletes to achieve their goals on the playing field and in the classroom. Contact Melissa Weitz at melissaw@uidaho.edu or 208-596-0588 with questions. Buy tickets. Drop-in mindful meditation is noon to 12:20 p.m. in TLC 029 today, April 17. This is gently-guided mindfulness for stress and productivity. No experience needed. Everyone welcome. Join via Zoom. Learn how to use REDCap, a secure web application for building and managing online surveys and databases. The Mountain West Clinical and Translational Research Infrastructure Network (CTR-IN) and University of New Mexico's Clinical and Translational Science Center (CTSC) are offering this free Zoom training that is available to faculty and staff 1-3 p.m. Tuesday, April 23. Read more. The deadline to submit items to the weekly My UI student newsletter is noon today for next Monday’s newsletter. Learn more about the newsletter and submit items. Employees can subscribe to the newsletter. Monica Ontiveros and Lukas Hiner secured critical certification from the U.S. Department of Labor that their client was a victim of trafficking crimes as a migrant agricultural worker. Ontiveros and Hiner, third year law students in the Immigration Litigation and Appellate Clinic, partnered with the Northwest Justice Project to provide assistance to three men who had received agricultural worker visas to harvest blueberries on farms in California and Washington. Once here, the men were fed rotten food, denied wages and benefits they had been promised, forced to work without immigration authorization and threatened with criminal and immigration prosecution if they objected to conditions. The certification from the U.S. Department of Labor details wide-ranging abuse of the workers and paves the way for key immigration benefits for the men and their families. Read more stories from Innovation Month. As part of the third cohort of Digital Scholarship Fellows, four faculty members and two students will pursue digital humanities research with support from the Center for Digital Inquiry and Learning. The Digital Scholarship Fellowship programs are supported by the College of Letters, Arts and Social Sciences and the University of Idaho Library, as well as the Office of Research and Economic Development, College of Graduate Studies and the Office of Undergraduate Research. Read about the fellows. As part of the Sovereignty Series, the College of Law presents guest speaker Ernie Stensgar at 3:30-5 p.m. today, April 16, in LAW 104. The event will also be available via live broadcast. Stensgar was born and raised on the Coeur d’Alene Indian Reservation. He is chairman of the Coeur d’Alene Tribal Council and president of the Affiliated Tribes of Northwest Indians, representing 55 tribes. He is also the first tribal leader to be awarded an honorary Doctor of Laws from Gonzaga University in Spokane, Washington. Stensgar’s leadership has involved bringing tribal and state governments closer together and enhancing government-to-government relationships with local and state governments. At 12:30-1:30 p.m. today, April 16, in the Horizon Room of Idaho Commons, Renae Campbell, historical archaeology doctoral student, will present on the legacy of Idaho's Chinese Pioneers. Today the Boise Basin is known for its outdoor recreation activities, historic graveyards and not-quite ghost towns, but it also contains a network of over 300 archaeological sites associated with Chinese miners and entrepreneurs who were among Idaho's earliest pioneers. Read more. The annual meeting of Arboretum Associates will be held Thursday, April 18, at the 1912 Center in Moscow. A social gathering with appetizers and a no-host bar begins at 6:30 p.m. A short business meeting begins at 7 p.m., followed by the keynote speaker, Linda Chalker-Scott, urban horticulturist of Washington State University Extension. Chalker-Scott is the author of several gardening books and the recently revised and updated, “Gardening with Native Plants of the Pacific Northwest.” Books will be available for purchase and signing. The program is free and open to the public. The Exercise Physiology Research Laboratory is seeking generally healthy adults aged 35 years and older, who have either been diagnosed with Type 2 Diabetes or never diagnosed with Type 2 Diabetes, to participate in a study investigating the effects of sitting on vascular function. This two-day study will require approximately five hours of time and will consist of anthropometric and body composition measurements, ultrasound measurements to understand leg blood flow, and blood draws to quantify blood sugars, fats, and markers of vascular function. Contact us for more information at exphys@uidaho.edu or 208-885-2007. Join the Biodiesel Education Program for a tour of the biodiesel lab at 3 p.m. Friday, April 19, in JML Bay 72, Moscow. The program is excited to show how it makes biodiesel as well as how it’s used to make U of I a cleaner campus. The Vandal Clean Energy club will also introduce its new B100 biodiesel tank. Internal seed funding is available for the National Science Foundation Established Program to Stimulate Competitive Research (EPSCoR) Research Infrastructure Improvement Track-1: Linking Genome to Phenome to Predict Adaptive Responses of Organisms to Changing Landscapes funding. The purpose of this GEM3 seed funding is to allow project leadership and the Idaho research community to respond quickly and effectively to new opportunities as well as pursue high-impact, potentially transformative research. Its principal objective is to catalyze new research on focal species, species interactions, ecosystems, genomics/phenomics and other emerging areas related to the scope of the GEM3 award. Read more. As part of the Office of Research and Economic Development efforts to support faculty scholarship at the University of Idaho, assistance is being offered to faculty members looking to apply as part of the Sept. 16, 2019, deadline for the Fulbright Faculty Scholars Program. A Fulbright Application Mentoring Session will take place noon to 1 p.m. Friday, April 26, in Room 402 of Morrill Hall, Moscow. Learn more. Research and Faculty Development will present an introduction to Pivot training from noon to 1 p.m. Wednesday, April 17, in IRIC 105. Pivot is a searchable database of funding opportunities, calls for papers and researcher profiles. Pivot provides information from federal and local governments, private foundations and public organizations for a variety of activities, including research and travel, in all academic disciplines. Participants will learn how to create and customize their profile and how to conduct, track and save a funding search. Also available via Zoom. Join Professor Greg Möller for a motivational talk at 9:30 a.m. Friday, April 19, in Room 106 of the Agricultural Science Auditorium. “The Quest for Earth” is a call to action for a positive future that includes balance to the relationship between humankind and Earth. This event is a part of the Sustainability Center's Earth Fest and will be live-streamed globally from uidaho.edu/earth. The U of I Distinguished Scholarships Program is hosting a general information session at 3-4 p.m. Monday, April 22, in TLC 047. This session will provide an overview of distinguished scholarships and details of scholarship opportunities with early fall 2019 deadlines (e.g. Fulbright U.S. Student Program, Rhodes, Gates Cambridge, Marshall, Mitchell and Schwarzman scholarships). For more information, contact Distinguished Scholarships Program Coordinator Dilshani Sarathchandra at dilshanis@uidaho.edu and/or visit the program website. Faculty, staff, students and alumni are encouraged to save the date for the Office of Research and Economic Development's fourth installment of its successful SAS (Short and Sweet) Talks, 4-7:30 p.m. Tuesday, May 7, in the IRIC Atrium, Moscow. Faculty from across the university will highlight some of the most fascinating and impactful research around the theme "Public Impact Research: How Does Research Make the World a Better Place?" The talks are given at lightning-fast speed: 20 slides at 20 seconds each. Admission is free, and food and beverages will be served. Learn more. Fredrick Shema, an international studies student from Rwanda, feels a connection to a Ugandan refugee camp that many University of Idaho students probably don’t know exists. The reason: he grew up there. "I’m originally from Rwanda, but my parents moved to Uganda’s refugee camp when I was 2 because of the genocide in Rwanda. That’s where I lived for most of my life until I got resettled here," Shema said. "My story motivates me and pushes me to make a difference in this world." Learn more. Steven Ghan, an atmospheric climate scientist who recently retired from the Pacific Northwest National Laboratory, will address national bipartisan climate change legislation during a talk this week on the University of Idaho campus. Ghan will speak at 3:30 p.m. Friday, April 19, in Room 111 of Renfrew Hall in Moscow. His speech is organized by the U of I Sustainability Center and the Palouse chapter of the Citizens’ Climate Lobby as part of the lobby’s annual conference. Read more. The University of Idaho program aimed at helping doctors treat opioid addiction is partnering with two southeast Idaho organizations for a five-session training on opioid misuse beginning Thursday, April 25. Project ECHO, part of the University of Idaho WWAMI Medical Education Program, is partnering with the Southeast Idaho Area Health Education Center (AHEC) and the Idaho State University Institute of Rural Health on five one-hour training sessions focusing on the best ways to treat patients with pain or opioid-use disorder. Each video conferencing session will consist of a brief lecture on a specific topic and a review of a real-world patient case. Read more. The boisterous pirate comedy, “The Three Keys of Captain Hellfire” makes its world premiere April 19-27 at the University of Idaho. With swordfights, assorted scallywags and buried treasure, “Hellfire” dives into a world of sea-going rogues where everyone has a secret and wants to strike it rich. Show times are 7:30 p.m. April 19-20 and 25-27 and 2 p.m. April 20 and 27 at the Hartung Theater, 625 Stadium Drive, Moscow. Admission is free for U of I students and $5-15 for the public. Matinees are “pay what you can.” Tickets are available at BookPeople of Moscow, at Shoup Hall suite 201, by calling 208-885-6465 or at the door 60 minutes before curtain. Read more. Mark Bathrick, manager of the U.S. Department of Interior’s Unmanned Aircraft Systems (UAS) program, will speak at 2 p.m. Friday, April 26, in the Vandal Ballroom of the Bruce M. Pitman Center on the University of Idaho’s Moscow campus. His speech is free and open to the public as part of the U of I College of Engineering’s Engineering Design EXPO. Read more. Candi Heimgartner of the Department of Biological Sciences was invited to lead "CSI @U of I" as part of U of I's STEM Days today and Wednesday, April 17, at the Idaho Water Center in Boise. During this session students from the Vallivue Advancement Via Individual Determination (AVID) program will be using human bones as part of an introduction to medical sciences. STEM Days is produced as a partnership between U of I and the Vallivue AVID program to introduce high school students to the fields of science, technology, engineering and mathematics. Over 200 Vallivue students are expected to attend this annual event. Congratulations to Sydney Freeman Jr., of the College of Education, Health and Human Sciences, who has been named to Auburn University's College of Education National Alumni Council. Freeman teaches in the Department of Leadership and Counseling and is the senior editor-in-chief of the Journal for the Study of Postsecondary and Tertiary Education (JSPTE). The youngest member of the council, he will serve a three-year term. Professor Jill Johnson, in collaboration with researchers at the University of Alberta and the University of Würzburg, recently published a paper in Nature Communications titled, "The Conserved NxNNWHW Motif in Aha1-Type Co-Chaperones Modulates the Kinetics of Hsp90 ATPase Stimulation and is Essential for In Vivo Function." This research seeks to understand how Hsp90 partners with interacting cochaperones to help 10-15 percent of cellular proteins fold properly. Read more. University Faculty Meeting: The next University Faculty Meeting will be 3 p.m. Wednesday, May 1. More information, including locations and Zoom information, will be available closer to the date. Nominations for Honorary Degrees for December 2019 Commencement Due April 15: Completed nominations must be submitted to provost@uidaho.edu. Michael P. Parella, dean of the College of Agricultural and Life Sciences, will lead an informational session from 10-11:30 a.m. Wednesday, April 17, in the Whitewater-Clearwater rooms of the Idaho Commons, Moscow, about the university’s mission to build the largest research dairy in the country — the Idaho Center for Agriculture, Food and the Environment. The project aims to develop science-based answers to address issues faced by agriculture and food production systems in Idaho. Learn more. Ali Noorani, a leading voice on immigration in the U.S. and executive director of the National Immigration Forum, will speak Thursday, April 18, as part of the College of Agricultural and Life Sciences Speaker Series. His talk, “Out of Many, One: A Defining Moment for American Immigration,” will begin at 6 p.m. April 18, in the Kenworthy Performing Arts Centre, 508 S. Main St., Moscow. Learn more. The Center for Health in the Human Ecosystem will fund up to five Technology Access Grants (TAGs) for U of I investigators interested in using the IVIS Imaging Service Center for research. Up to $1,200 per project will be awarded for hours of training provided by the service center, for use of the IVIS Lumina III and for data analysis completed on service center computers. Applications will be reviewed starting today, April 15, and continue until five TAGs are awarded. Apply now. World-renowned climate scientist Steve Ghan will discuss national bipartisan climate change legislation during a talk this week. Ghan will speak at 3:30 p.m. Friday, April 19, in Room 111 of Renfrew Hall in Moscow. His speech is organized by the U of I Sustainability Center and the Palouse chapter of the Citizens’ Climate Lobby as part of the lobby’s annual conference. The Office of Research and Economic Development (ORED) RISE (Research, Infrastructure and Scholarly Excellence) internal funding programs Advancing Collaborative Efforts (ACE) and Arts and Humanities Project Support (A&H) deadlines are approaching. The ACE program provides seed funding for early stage development of large, collaborative proposals, and the A&H program provides funding to support scholarly or creative efforts in the arts and humanities disciplines. All proposals must be submitted and approvals completed through VERAS by 5 p.m. Monday, April 29. Details on each of these programs, including instructions to apply, can be found here. Information on all RISE Funding Programs can be found here. Questions can be directed to ored-rfdteam@uidaho.edu. Mark Bathrick, director of the U.S. Department of the Interior's Unmanned Aircraft Systems program, will speak at 2 p.m. Friday, April 26, in the Vandal Ballroom of the Bruce M. Pitman Center on the Moscow campus as part of the University of Idaho's Engineering Design EXPO. Bathrick has overseen more than 19,000 drone flights throughout his career. Graduating from the U.S. Naval Academy with an aerospace engineering degree, Bathrick spent 25 years in the Navy, and even attended the Navy Fighter Weapons School TOPGUN. He's flown more than 40 different types of military and civilian aircraft, logged 3,700 hours of flight time along the way, and trained at Britain's famed Empire Test Pilots' School. The U of I Distinguished Scholarships Program is hosting an information session on the Fulbright U.S. Student Program at 10 a.m. Monday, April 22, in TLC 047, Moscow. This session features a panel of faculty and student experts, who will share advice on how to develop a strong Fulbright application. More information is available by contacting Distinguished Scholarships Program Coordinator Dilshani Sarathchandra at dilshanis@uidaho.edu or the program website. Construction zone in your way? Don't be tempted to go around barriers and travel through the site as a shortcut, both for your safety as well as the safety of the construction workers. Barriers are there for a reason, and it isn't worth the risk of injury or property damage. Read more at I-Safety for information on your safety and responsibilities around construction zones. Avery Brock is a tinkerer. He’s been playing with circuit boards and soldering irons since he started building model trains with his dad as a child. “Playing with electronics and building stuff — it’s what I do for fun and hopefully it’s going to be my career,” Brock said. 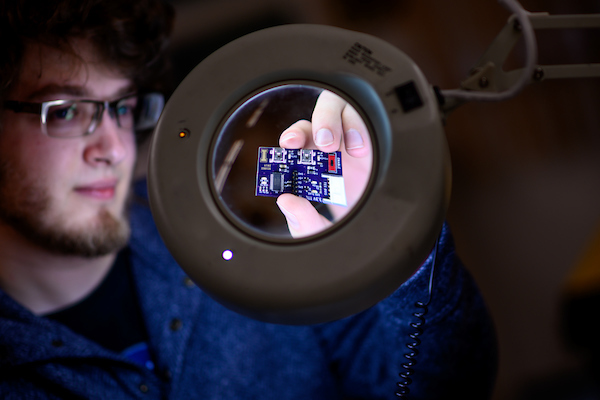 The 21-year-old University of Idaho electrical engineering major from Redmond, Washington, has since upgraded his hobby, but still tinkers in his dorm room and in the university’s engineering laboratories. Read more. Public lands take up a large chunk of the American West and are at the forefront of some of today’s most contentious political issues. Historian and Colorado State University Assistant Professor Leisl Carr Childers will attempt to untangle these issues during a discussion at 5:30 p.m. Monday, April 22, in room 046 of the Teaching and Learning Center on the University of Idaho campus. Read more. The University of Idaho is pleased to announce that Ben Hunter has been named as the next dean of University of Idaho Libraries, effective April 21, 2019. Hunter is currently the interim dean and has worked in U of I Libraries since 2006, serving as an associate dean since 2014. “It is an honor and a privilege to take on this new role at the University of Idaho,” Hunter said. “This is an exciting time for libraries and an exciting time for the university. I am thrilled to lead the remarkable team at the U of I Library as we support and advance the teaching, learning, research and scholarship goals of the University of Idaho.” Read more. Clint Elg is one of only 2,050 students nationwide who is receiving the prestigious and very competitive National Science Foundation graduate research fellowship this year. Elg is a doctoral student in the Bioinformatics and Computational Biology program and is in the lab of Biological Sciences Professor Eva Top. Read more. Thank you all for your participation and patience as the Idaho State Board of Education led the process of selecting the 19th president of the University of Idaho. We are proud to welcome C. Scott Green to this role after a unanimous vote of the board. The Vandal alumnus and international business leader will take office Monday, July 1, 2019. Learn more about the new president and watch his introduction. Athena is pleased to announce Department of Sociology and Anthropology Professor Leontina Hormel and Associate Professor, Interim Associate Dean, and Head of User and Research Services Kristin Henrich, University of Idaho Libraries, as the winners of this year's Women of the Year Awards. We are also happy to announce Rebecca Witinok-Huber, a doctoral student in the Water Resource graduate program, as the Athena Student Excellence award winner. All are invited to the celebration of these women from 5-7 p.m. Monday, April 22, at the newly opened University House. There will be complimentary appetizers and a no-host bar. RSVP here by April 17. The University of Idaho recognizes the importance of the arts throughout its statewide locations. Arts-Fee grants are provided to defray costs related to originating, producing and presenting creative projects. Students, faculty members and academic units are all eligible for arts grants. In addition, students are invited to submit artwork for the utility box art project. Completed applications are due no later than 11:59 p.m. today, April 12. Email completed application packets to uiarts@uidaho.edu. The application can be downloaded on the U of I Arts Committee webpage. The Prichard Art Gallery will feature work from University of Idaho Master of Fine Arts candidates in the MFA Exhibit "Asterisk," beginning with an opening reception at 5-7 p.m. Friday, April 12, in the gallery. The exhibit runs through Saturday, May 11, and includes work from three graduating master's students from the College of Art and Architecture — Logan Clancy, Jonathan Matteson and Ashley Vaughn. The students' mediums include abstract digital videos, sound art, multimedia and watercolor relief prints. Read more. University of Idaho faculty, staff and students as well as industry leaders and community members are invited to experience the 2019 Engineering Design EXPO. EXPO 2019 will be held 9 a.m. to 3:30 p.m. Friday, April 26, in the Bruce M. Pitman Center, Moscow. A complete schedule of events can be found at www.uidaho.edu/expo. EXPO showcases senior projects from the College of Engineering's senior capstone program. This year's keynote speaker is Mark Bathrick, director of the U.S. Department of the Interior's Unmanned Aircraft Systems program. He will speak at 2 p.m. Friday, April 26, in the Vandal Ballroom of the Bruce M. Pitman Center on the Moscow campus. The College of Graduate Studies will host the eighth annual Innovation Showcase from 8 a.m. to 3 p.m. Thursday, April 18, in the Summit Room of Idaho Commons. The Innovation Showcase spotlights undergraduate and graduate students' research and creative activity at the University of Idaho. Presentations will occur in 30-minute increments. This event is free, and open to the public. Learn more about the event. Join the Biodiesel Education Program for a tour of the biodiesel lab at 3 p.m. Friday, April 19, in JML Bay 72, Moscow. The program is excited to show you how it makes biodiesel as well as how they use it to make U of I a cleaner campus. The Vandal Clean Energy club will also introduce its new B100 biodiesel tank. Katerina Bodovski, author and associate professor of education at Pennsylvania State University, will talk at 1:30 p.m. today, April 12, in Room 111 of Renfrew Hall, Moscow, on creating work/life balance in the face of escalating expectations on tenure-track faculty members. The talk is put on by the College of Education, Health and Human Sciences. Read more. The VandalStore Spring Clearance Sale runs through Sunday, April 14. Clearance rates are 40 percent off marked prices on clearance items from clothing to trade books. The sale is in Moscow and Boise. Joelle Stephens has always been fascinated by the human body. So much so, the 21-year-old Moscow native decided to dedicate her life to studying it and hopes to become a registered nurse after graduating from the University of Idaho this spring. Read more. The University of Idaho is proud to welcome C. Scott Green as the 19th president of the university. The Vandal alumnus and international business leader will take office Monday, July 1, 2019. His appointment comes after a unanimous vote of the Idaho State Board of Education today. Read more. Storytelling through film is the focus of the University of Idaho’s second annual Ambrose Storytelling Workshop, to be held from 10 a.m. to 3 p.m. Wednesday, April 24, in the Idaho Commons Whitewater Room. Read more. Ali Noorani, a leading voice on immigration in the U.S. and executive director of the National Immigration Forum, will speak Thursday, April 18, on the University of Idaho campus as part of the College of Agricultural and Life Sciences Speaker Series. His talk, “Out of Many, One: A Defining Moment for American Immigration,” will begin at 6 p.m. April 18, in the Kenworthy Performing Arts Centre, 508 S. Main St., Moscow. The event is free and open to the public. Read more. Eight University Honors Program students presented their research at this year's Western Regional Honors Council conference March 29 at Montana State University in Bozeman, Montana. Diane Carter, senior instructor in the Department of Psychology and Communication, traveled with Ren Dimico, Abigail Hale, Brenna Peever, Abigail Dunn, Natalya Usachenko, Elizabeth Hoots, Alice Cassel and Samuel Myers to the conference. Dimico and Myers's research projects were supported by a University Honors Program Grant for Undergraduate Research. The conference also included a day trip to Yellowstone National Park. Join the College of Natural Resources and the entire campus community in celebrating the retirements of two University of Idaho faculty: Steve Daley-Laursen, former interim U of I president, former CNR dean and professor of Natural Resources and Society; and Penny Morgan, professor of fire ecology and management, and leader of U of I’s fire program. A retirement reception will be held from 3:30-5 p.m. Monday, April 22, in the IRIC Atrium, Moscow.